Gaumukh-Tapovan trek, one of the most gratifying treks in India, located in Uttaranchal will bring every fascinating trekking pleasure while passing through an orchard of coniferous pine trees at Chirbasa and birch at Bhojbasa. From Bhojbasa the trek will take you to Lanka and Gaumukh. On the other hand, this trek can be undertaken by the non-mountaineers too who are being studded with a good health. Perching on the high peaks one can get the common sight of the herds of Blue mountain goats- Bharal. Explore the Gaumukh Glacier, which is just four kilometers ahead from Bhojwasa. From Gaumukh to Tapovan the climb is steep, and as we climb, the view of the surroundings peaks becomes clear. Gaumukh is the hatchway of the glacier to spring the Ganges, and Tapovan are the mighty peaks of the Garhwal. 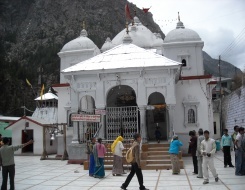 The Gangotri Tapovan trekking is made for all adventure lovers to let them involve into Mountain Climbing, Rock Climbing and glacier traverse. The Gangotri trekking tours bring a fantastic opportunity to get acquainted with the colossal Himalayas and to feel the taste of the Indian culture. At Gaumukh, one can find the mighty Ganges gushing out of a snout like opening. The awe-inspiring view is undoubtedly being revered by all (both adventure and nature lover). Once you intertwine through Gangotri to Tapovan, every twist in the trail reveals another stunning beauty of snow clad Himalayan giant. The beauty of Tapovan is something which is just unjust mere to explain in words but without experiencing it. Surging alpine meadows, network of gurgling streams and the presence of some renowned Himalayan peaks very next to you, makes one of the most awe inspiring sights of the region. 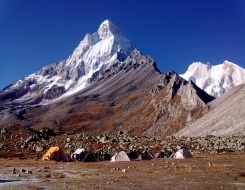 Camping can be a fun right at the base of the Shivling peak at an altitude of 6543m, called the Matterhorn of Garhwal. From Tapovan, the trek will take you towards Nandanvan, by retracing your steps to come back to Gangotri and then making a good start of hiking towards the next Himalayan destination at the high altitude lake of Kedar Tal. Here the walk/trekking is mostly through glaciers to join back to Gangotri and then to drive down to Uttarkashi and then finally to Rishikesh making a majestic end to Gomukh Tapovan Trek. Upon arrival at Delhi transfer to hotel for overnight stay. In the morning after breakfast drive to Haridwar. Lunch enroute at Chetal Grand khatauli. Upon arrival at Haridwar met our representative and transfer to the hotel. Evening visit the Har-ki-Pauri for the ceremony of Ganga Aarti. After that Back to hotel for relax and overnight stay. Morning after breakfast drive 245 kms to reach the Gangotri via Uttarkashi and a beautiful valley Harsil. Enroute take a holy dip in Gangnani hot water springs. Arrive at Gangotri by evening. Check in to hotel for dinner and overnight stay. Morning after breakfast we commands our trek further to Bhojbasa via Chirbasa (3600mt). From Gangotri we move along the beaten track towards chirbasa, which is on tree line. The entire trek today is along the roaring bhagirathi river.Beyond chirbasa the terrain becomes really desolate and barren. In fact, it has been referred to as Artic Tundra by many trekkers. From chirbasa we trek further to Bhoibasa, the entire trail passes through dense forest, Arrive Bhojbasa, there is a small temple and a potential campsite near down the river. We make our camp near river side. Afternoon free to explore the area and to enjoy excellent sunset on Bhagirathi group of peaks. Dinner and overnight stay in tents. Early in the Morning enjoy the panoramic view of Bhagirathi group of peaks. After breakfast trek to Gomukh (3890mt), the source of the Ganges. Gomukh is where the water of Ganga trickles down from the glaciers. The sages called it 'Gomukh', because in the distant past, it probably appeared like a cow's mouth. Explore the area and trek to Tapovan, one of the finest high altitude alpine meadows in the area. The trek from Gomukh to Tapovan is ascent steep, and as we climb, the view of the surrounding peaks becomes clearer. The appear to be just a stone's throw away. Tapovan known for its beautiful meadows that encircle the base camp of the Shivling peak, Tapovan is a very pleasant surprised spot with a large meadow complete with bubbling streams, wildflowers and campsites. Herds of Bharal (blue mountain goats) is a common sight from here on mountain ridges. On the far side of the glacier the Bhagarithi I, II, III (6454mt), provide an equally impressive backdrop. It is also the little wonder where Sadhus and saints choose this spot for extended meditation during the long summer month. Arrive Tapovan and camp. Dinner and overnight stay in camp. Gomukh: The Gomukh glacier is the source of Bhagirathi (Ganges) and is held in high esteem by the devout who do not miss the opportunity to have a holy dip in the bone chilling icy water. Tapovan: Tapovan is an ideal location for the tourists looking for peace and adventure. Tapovan is located on an altitude of 4463m / 14640ft above sea level. Tapovan is base camp for Shivlinga peak in Uttrakhand hills. One can also have a nice view of Bhagirathi peaks from Tapvan Meadow. Every year this place has been visited by thousands of tourist including foreigners for adventure activity like mountaineering & trekking. We trace back to Nandan van via Gomukh glacier. The route from Tapovan leads from the upper section of the meadow till down and onto the glacier. From Gomukh turn towards Nandanvan (4340m) and steering on right one will be on top of the Gangotri glacier. The glacier runs between two ranges and the landslides make a layer of rocky moraine on the ice which makes the walking easier. The glacier walk is very slippery and a slight lack of concentration would be dangerous. Huge crevasses gaped here and there. After a walking for about a kilometer there is a vertical ascent. Big rocks enroute offer grips and foot - holds but many of them are deceptive too. Dinner and overnight stay in tents. Free to acclimatize, relax and enjoy the magnificent snow capped peaks, flora & Fauna and mountain landscape. Dinner and overnight stay at the camp. Early morning enjoy the sunrise on high peaks. After breakfast trek down to Bhojbasa. Arrive Bhojbasa and camp. Dinner and overnight stay at the camp. Morning after breakfast drive to Haridwar. On arrival check in to hotel. Dinner and overnight stay. In the morning half day sight seeing at Haridwar including Mansa Devi & Chandi Devi. After lunch depart for Delhi. Arrival at Delhi by evening. Dinner and overnight stay at hotel. In the morning half day sight seeing at Delhi. Evening transfer to airport to catch your onwards flight.